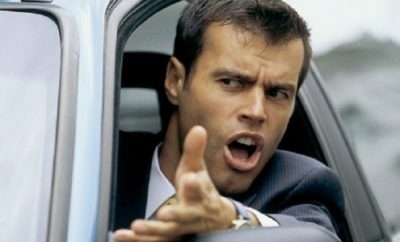 Are your kids clamoring at your feet complaining of boredom and the heat? 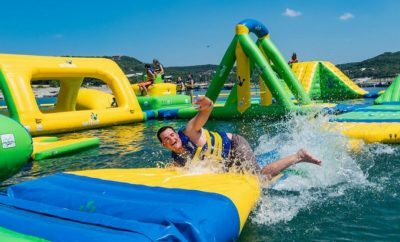 Well, how about creating a mini adventure for your family to put the fun back into summer? 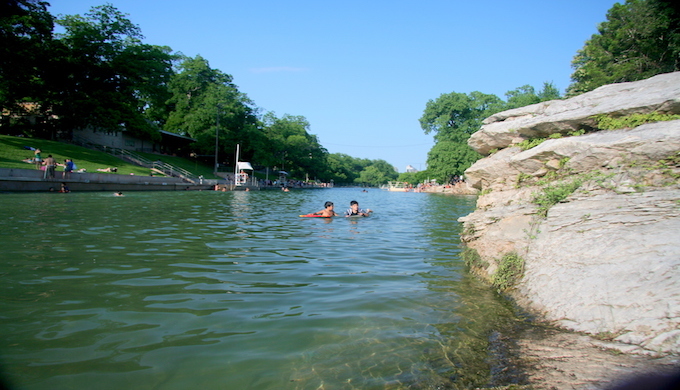 Although the concept of Pocket Adventures started in Austin, you don’t have to live there to create your own. Read on for an account of a recent pocket adventure and then plan one all your own. Pocket Adventures are the brainchild of Austin American-Statesman reporter Pamela LeBlanc and Meredith Walker (executive director of Amy Poehler’s Smart Girls online community). 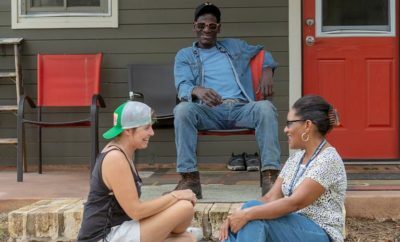 The event series aims to get Austinites off of their couches and out on the town by scheduling meet-ups centered around various local attractions. 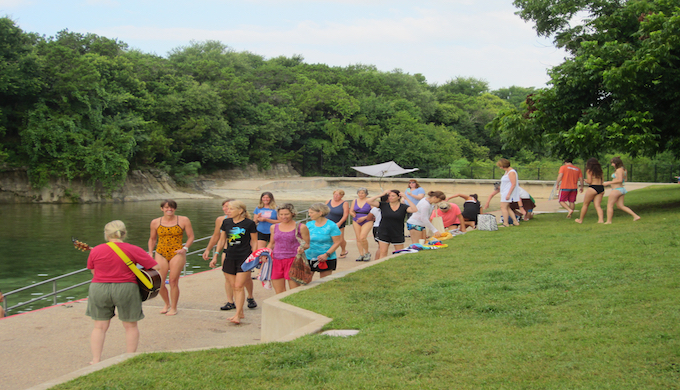 The Pocket Adventures inaugural event entitled, “Get Your Hair Wet” took place under the shady oaks at Barton Springs Pool late in June. 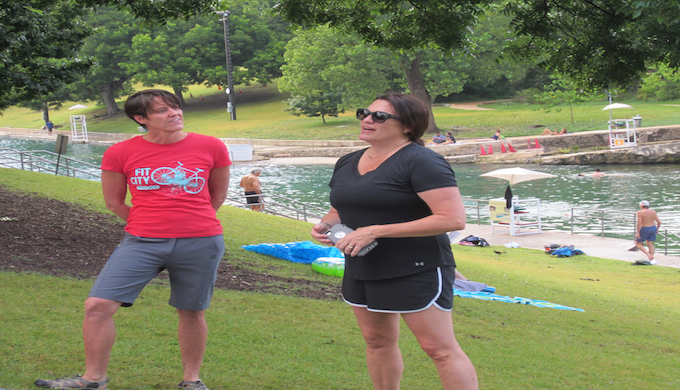 Hosts Walker and LeBlanc explained that the purpose of Pocket Adventures is to bring the community together to celebrate the special things that make Austin such a great place to live, like the spring-fed pool. A short information presentation covered the history of the pool and its importance to the community. Karen Kocher, recognized documentary filmmaker, spoke about an interactive documentary film series that lays out some interesting facts about Barton Springs like that 30 percent of the water that flows into the springs originates from Onion Creek. And that the Barton Creek salamander once thought to only live in Barton Creek, was actually recently discovered living it up on nearby ranch property. After the presentation, singer-songwriter Sara Hickman (named 2010-2011 Official State Musician of Texas) performed a few tunes to rouse spirits and lift hearts. Her joie-de-vivre soon had the crowd on their feet as participants shucked their shorts and shirts and formed a bathing suit-clad dancing procession following Hickman down to the pool.